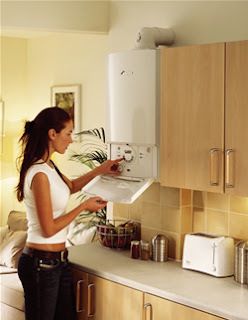 Your central heating system is an important investment for your home and can save you money and lower your energy bills if the system you choose is the right one for you. Storage heating works by storing up heat when the electricity is running at a cheaper rate during the night time. The storage heater will then begin to release the heat during the day, meaning that your home stays warm when you need it to. Inside the storage heater are storage banks which are comprised of different materials such as clay bricks, concrete walls or water containers. When the heater is ‘on’, electricity will heat up the elements and these will heat the bricks or walls. The bricks are surrounded by insulation but as they grow hotter the heater casing gets hotter. The heater casing then heats the room. The storage heater becomes cooler as the day draws to a close but the walls of the room in which it has been operating are like a storage heater themselves and comfort will be maintained. This system features a two tariff meter for its electricity consumption and this will record the off peak tariff separately and charge it at a lower rate than the on peak electricity. Storage heaters are ideal for any room in the home, such as living rooms, bedrooms and also bathrooms. 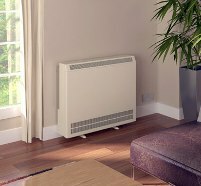 Storage radiators are suitable for homes that are occupied in the day and particularly for young families and the elderly. People who have their own businesses and work from home will also benefit from this type of home heating system. This type of heating is popular in modern homes and apartments and it is also used extensively to heat offices, restaurants and shops. You can use a programmable timer to ensure that your heat is released during the day or when it is needed the most. Modern storage heaters now feature an automatic charge control to adjust the amount of heating that is stored within them. This works by measuring the room’s temperature and when the room becomes cooler, the heater will emit more heat so that it maintains a constant temperature. Storage heating can save you money on your bills because of the cheap tariff used for electricity during off peak hours (the night time).